This product is a neutralizing agent in pursuit of safety and functionality. Such as sulfuric acid, it is difficult to handle and dangerous as a deleterious substance. However, this product considers the safety of the worker, and secured a strongly acidic function as a neutralizing agent. By all means, please use because one is containing 20L so that are useful in large-scale construction, and the one is 1L which is convenient for carrying. It is economical effecting with a small addition amount. For pH12.0, neutralizing completed with 2ml / ℓ. The neutralization can proceed in 1-2 minutes. React quickly and reduce the burden on the operator with the liquid product. It is safety-conscious. Safe to touch by hands. 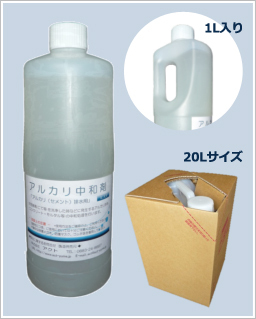 “Alkaline neutralizer” is less than pH1.0, please observe the correct usage. 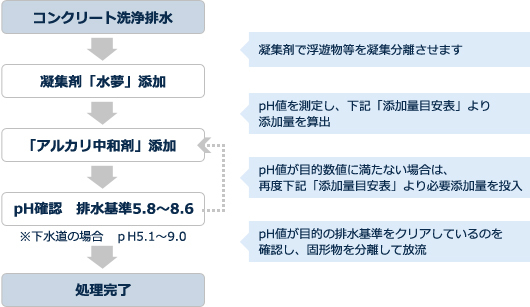 ※Addition amount in the table above, depends on the cement concentration, so operate as a duide and please make sure to measure the pH before discharging. Added powder of Suimu in the drainage which you want to treat. Stir for 2 to 3 minutes, and allowed to aggregate suspended solids. See the amount guide table above, and then weighing the “alkaline neutralizer”. Stir for 30 seconds to a minute or so, and let it go to the whole. Check the pH value, and if it is clear the effluent standards of purpose, process completion. Separating the solids, and then release. ※ If it’s not clear the standard at the way 6, back to the way 4 and repeat the same process to the end again. Hydrochloric acid (35%)> sulfuric acid (70%)> this product about corrosivity. There is corrosive because it is strongly acidic, but corrosion is low in comparison to hydrochloric acid and sulfuric acid. Because you can use the material that is corrosion resistance against sulfuric acid (70%) in peace, please operate as a guide.In addition, on the occasion of use and storage, you can use it safer applying the way to operate hydrochloric acid and sulfuric acid. This product is to neutralize the alkali. Please note that it is not available for acidic drainage. This product is slightly acidic, so please be careful not to spill directly into the rivers. If you want to dispose, please neutralized with an alkali agent and rinse with plenty of water. If you have outflow by any chance, please neutralized with an alkali agent and rinse with plenty of water. Please note that not to let it be into eyes or not to swallow it. Please wear protective goggles, and rubber gloves. Please use after confirming the MSDS of our products. Please use immediately after opening. Tighten the lid properly and store in an upright position after use so that it does not spill. If you want to discard, please neutralized with an alkali agent and rinse with plenty of water. (Take them away immediately if you are wearing contact lenses) wash eyea with large amounts of fresh water, and please consult a doctor immediately. Rinse well with water, please consult a doctor if there is an abnormalitｙ on you. Spit it out as much as possible and drink plenty of water or milk, and please consult a doctor as soon as you can.